My first introduction to any of the music from this new Bonobo album was without knowing it. His Boiler Room DJ set opener from last year turned out to be first single Cirrus, but without a set list at the time I had no idea it was from his forthcoming album. February 2013 saw the official launch of Cirrus, along with a suitably brilliant glitch/cut and paste inspired promotional video directed by Cyriak who has aptly been referred to as Michel Gondry on amphetamines. March 22nd 2013 saw the digital release of the album, ahead of it’s April 1st launch due to an online leak from a promotional copy. Bonobo took to twitter clearly not happy with the breach in trust and it soon became apparent a radio station intern was responsible. Now on his fifth album, Bonobo is no stranger to the scene and has been slowly but surely building up a loyal following through his releases, remixes, DJ sets and incredible live shows. A one man outfit, Simon Green enlists the help of other musicians (including a drummer) to give the live sound a more organic feel. This helps avoid the clichéd ‘one man and his laptop’ trap that many electronic artists find themselves in ‘live’ surroundings. The North Borders isn’t a million miles away from previous album Black Sands and again he has enlisted a few guest vocalists to do their thing. The biggest name being Erykah Badu on Heaven for the Sinner. The two artists sounds fuse perfectly, Badu’s laid-back vocal delivery sitting nicely atop Bonobo’s jerky two-step track. There are harp strums, clicks and strings all in there, and as with much of the rest of the album, despite all the electro leanings, most of what Bonobo does has its roots in orchestral and traditional sounds. Opening track First Fires features guest vocalist Grey Reverend who Bonobo has handpicked from his adopted home of New York to appear from relative obscurity. Beautiful string build-ups and rolling beats underlie lyrics about the return of desire, “Honestly I can’t believe its burning again, like a first fire”. The song dips to what resembles a string quartet before dropping the beat again. Cirrus nestles in the third slot on the album, between Emkay (with its catchy looped garage-esque vocal sample and beats, rim shots and a string breakdown to close) and the Badu track Heaven for the Sinner. I’ve had Cirrus on repeat for a good few months now and it shows no signing of growing tired either. The track simmers along nicely, never changing that much other than for the drops, but somehow finding a way to drill itself in to your being and leaving you thirsty for more. There’s bells, chimes, and percussion galore. The sound of pure joy, it could easily be a prayer or chant. Sapphire is a slightly faster paced track, there’s plenty more clicks, keyboards, and some harp picking. The track as a whole is slightly more hard edged, with a more aggressive feel and a heavier bass sound. Jets is slanted more towards hip-hop productions. I could see this track being looped and picked up by a rapper once the full bass kicks in around the one and a half minute mark, but hopefully not. Towers is the first of two tracks on the album to feature unknown female vocalist Szjerdene, again hand picked by Green. Her stunning vocal is teamed with some chipped 8-bit keyboard sounds and a nice laid back groove. The exposure on The North Borders will hopefully give Szjerdene the opportunity of more work elsewhere as I’d definitely be happy to hear more of her. Her other guest spot on Transits showcases her vocals nicely against a faster paced track. Other than First Fires, Cirrus and Heaven for the Sinner another standout track is Know You. This dancefloor friendly track makes you forget where the volume levels end. With throw backs to the big beat tracks of bygone days and a nice deep bass, this track builds up gradually before ditching you straight back down on a simple click and fat bass drum before taking you back round for another bout. 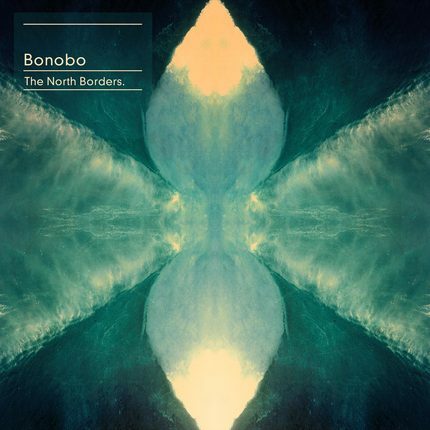 With The North Borders Bonobo shows again how electronic instrumentation and sounds can be married smoothly with a more traditional approach whilst keeping abreast with current trends. He’s found his niche and is happy continuing down this path to great effect. Not so much groundbreaking as ground shaking. Bonobo will be on tour in the UK in May, check his website below for full dates.